We are excited to announce Chef Nicolas Jordan has joined Le Cordon Bleu Ottawa Culinary Arts Institute’s team of Pastry Chef Instructors. Under his guidance, students will learn to master world class techniques in pâtisserie including, sugar skills, chocolate tempering, decorating as well as presentation skills. 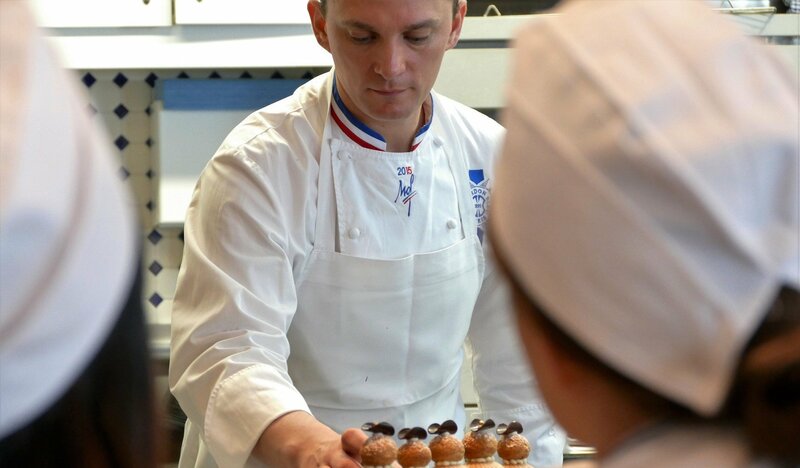 Chef Nicolas dexterity as a master sculptor producing daring creations has seen him earn the honorary title of: Un des Meilleurs Ouvriers de France M.O.F - ‘One of the Best Craftsmen in France, Ice and Ice Cream’. Throughout the course of his career, he has taken ice carving and sugar techniques to new heights, resulting in various prestigious awards including: Bronze Medal Ice Carving at Winterlude Ottawa 2010, Ice Sculpture France Championship Winner 2010, Winner of the Ice Desserts Open at the Sirha 2011 and made the selection for The World Pastry Cup 2013 team in France. Born in Vannes, France, he gained his professional CAP certificate in pâtisserie under the apprenticeship of Mr. Alain Chartier M.O.F - Best Craftsman in France. He then went to work at esteemed two Michelin-starred Laurent restaurant in Paris, before heading off to Canada to work along Christian Faure M.O.F - One of the Best Craftsmen in France, Ice and Ice Cream. In 2011, Chef Nicolas joined the team of pastry Chef Instructors at Le Cordon Bleu School in Paris before joining the Ottawa team. Ice carving and sugar technique may be his specialty, but Chef Nicolas has certainly mastered the pastry chef’s repertoire. He has been awarded many prestigious culinary awards, trained along some of the best and is now sharing his love of pâtisserie with students at Le Cordon Bleu Ottawa Culinary Arts Institute, the exclusive North American campus of Le Cordon Bleu.